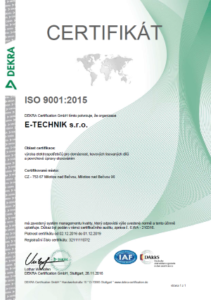 Our company is certified according to ISO 9001: 2015 and we comply with QS or VDA standards for automotive production as per customer requirements. We are currently preparing our system for the certification of ISO TS 16949. We are able to supply measurement protocols, SPC cards or machine and process capability protocols.